A very nice 1/4 plate (3 1/4" x 4 1/4") horizontal tintype of a mother and son, the latter of which wears the standard infantry frock coat of the Union army. The forage cap atop his head has brass insignia, but they cannot be identified due to the angle. The image is in excellent condition, having just some very light crazing. Comes housed in a half leather case. Please see my other items for more interesting and original Civil War pieces. 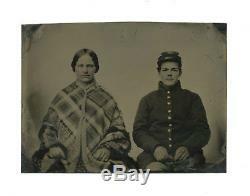 The item "1/4 Plate Civil War Tintype of Young Union Soldier Posed with Mother" is in sale since Sunday, October 7, 2018. 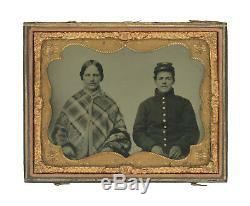 This item is in the category "Collectibles\Photographic Images\Vintage & Antique (Pre-1940)\Tintypes". The seller is "iron-horse-sales" and is located in Champaign, Illinois. This item can be shipped to United States, Canada, United Kingdom, Denmark, Romania, Slovakia, Bulgaria, Czech republic, Finland, Hungary, Latvia, Lithuania, Malta, Estonia, Australia, Greece, Portugal, Cyprus, Slovenia, Japan, China, Sweden, South Korea, Indonesia, Taiwan, South africa, Thailand, Belgium, France, Hong Kong, Ireland, Netherlands, Poland, Spain, Italy, Germany, Austria, Israel, Mexico, New Zealand, Philippines, Singapore, Switzerland, Norway, Saudi arabia, United arab emirates, Qatar, Kuwait, Bahrain, Croatia, Malaysia, Brazil, Chile, Colombia, Costa rica, Panama, Trinidad and tobago, Guatemala, Honduras, Jamaica, Bahamas, Viet nam, Uruguay.